IT'S WHAT MR & DKS DESERVES!!!!! More from wrap up party video. ISH cried I hope they remain a good friend. Btw, many people complained why Soo ah suddenly joined them during hug. Hahaha! I am even complaining why was she sitting between CEW and ISH! I still can’t get over her character. I mean for the entire duration of the drama she was so bad. LOL! I felt like I’m being one of those possessive and ridiculous fans of CEW! Sorry so childish of me. I wanna ask the same thing... That's really a bad timing... you can hug Mirae later, girl.. I THINK I NEED TO REWATCH THIS WHOLE DRAMA AGAIN..
Hah. So many comments. I almost wish that actress is secretly dating CEW then all the fans will faint. Personally I don't care, since the actress must be comfortable with them to sit between them and join the hug. Since we all know the real K entertainment world hides their reality from the fans. Slept only 3 hours last night but my tiredness went away as soon as I started watching the finale!! THIS IS THE BEST DRAMA FOR ME OF 2018!!! Thanks for all the shared discussions everyone!! It was so much fun sharing our sentiments and opinions on this drama! I'll still continue lurking here but this drama was seriously so much fun to watch (despite the painful, lengthy Monday to Thursday lulls), and I'll still get a good kick out of it when I'm rewatching! Hahahaha I was also thinking the same lolz .. I m also childish like u.. I wanted ISH n CEW to sit together.. But anyway they were facing the same direction n most of the time CEW was looking at ISH while JWR was eating ..
JTBC’s “My ID is Gangnam Beauty” went out with a bang! According to Nielsen Korea, the September 15 finale scored average viewership ratings of 5.8 percent nationwide and 6.2 percent in the Seoul metropolitan area—the highest ever achieved by the drama during its entire run. Although fans of the webtoon were initially worried that its message would be lost in translation, the drama stayed true to the heart and soul of the original work. “My ID is Gangnam Beauty” preserved the webtoon’s realistic but meaningful message about inner beauty, but it also added just enough of its own charm to keep the story new and refreshing. 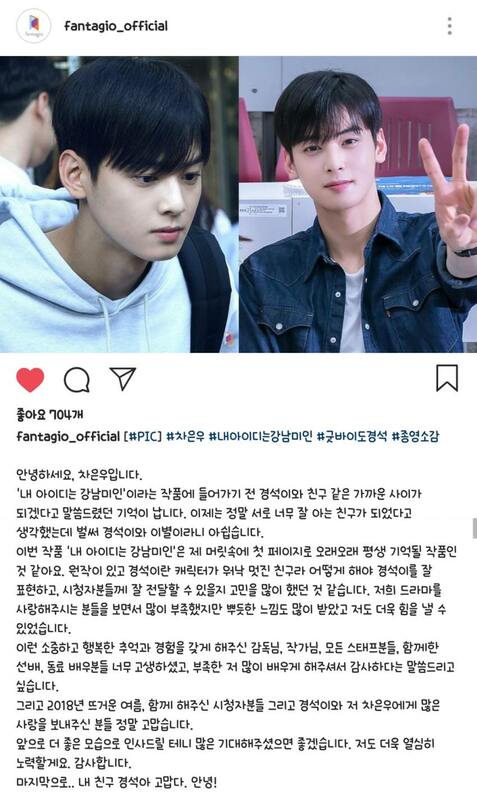 “My ID is Gangnam Beauty” depicted the emotional turmoil and development of Kang Mi Rae, who struggled to come to terms with her looks and longed to be acknowledged for her physical beauty. Even after achieving the pretty face of her dreams through plastic surgery, she found herself unhappy and insecure. Are you sad to see “My ID is Gangnam Beauty” come to an end? P. S. The first reason is my complete reason to stick to this show forever!! even cutting a cake he still hold her hand! Cute! I thoroughly enjoyed this show. I don’t think there was a single scene I didn’t like. Yes, even when Soo-ah was less than charitable to Mi Rae I still liked the scene because it was part of the story and her true personality. I commend the script writer for satisfying me on the point of Mi Rae’s assistance to Soo-Ah. One thing I have never liked is unrealistic attitudes and feelings by heroines. The writer did Mi Rae justice by having her acknowledge that yes she hates Soo-Ah and yes she didn’t want to help her when Eun first asked at the cafe. It completely satisfied me that Mi Rae had these “realistic” feelings and so any help she gave Soo-Ah afterwards was completely fine with me. At least her feelings for Soo-Ah didn’t “magically” change especially after all the terrible things Soo-Ah did to her and said to her. I’m completely satisfied with the resolution of their story. I confess that for the first ten minutes of this final episode I could barely sit still as Mi Rae’s parents and Kyung Seok had me cracking up. I loved everything about their scenes as well as all the OTP’s scenes. I love that Kyung Seok is already thinking of marriage. Heh. He’s quite serious about Mi Rae. I think the last scene was nicely done because it somehow conveyed a continuation of their love story even though the credits began to roll. I think if it had ended at the observation deck it would have felt final. Ending it where they are dressed in their couple hoodies, holding hands and walking toward the camera with their friends gives it a feeling of continuation for me. I liked the idea of HJ and WY and I think there is some hope there. The bar couple’s final scenes were nice too. Eun is still a character I really like to the end. Still, all the characters, even that awful Chan Woo made this drama very interesting. I’m glad in the end that Mi Rae and hopefully the other girls understood that rather than being obsessed with their appearance, find the things that make them happy and worthwhile while living their lives. I Hope all the bts will be subbed ! What's your ultimate favourite scene?!?!??! Watching the last ep is so bittersweet and yup I'm one of those who oppose JWR to go near CEW too hahaha. Let Mirae and Kyungsuk have their last moment at the wrap up party, girl. You can have Wonho instead I wish JTBC give them a reward vacation though because they did well in terms of ratings and they truly deserve one for all their hardwork. The hardest part now is for me to let go of this drama and my new obsession of watching Astro's videos on youtube. I blame you CEW why you make me stan you and your group??? edit:Anybody who knows SK very well, where is this place exactly? The place is so beautiful and scenic. Has the cold weather started already? Its so chilly and windy!!!!!! Is it the Great Britain's flag they are wrapped in? All scenes with DKS smiling, smirking, grinning, beaming and also when he's pissed off. i have extremely many fav scene. 2. The tender moment when Mirae sleeps with her mother on epi3. And her word "life is all about fighting through your struggles" hits me hard. Its like if you're going through a situation that feels like hell, keep moving. Why would you stay in hell anyway. wait. If im making list i need to rewatch the whole drama. I would say the whole drama is my favourite for now.